Are Frosted Flakes Healthier Than an Avocado? There has never been a better time to ignore the healthy eating guidelines than now, because according to government officials, eating pop tarts and frosted fakes are actually healthier than an avocado, almonds, or even salmon. 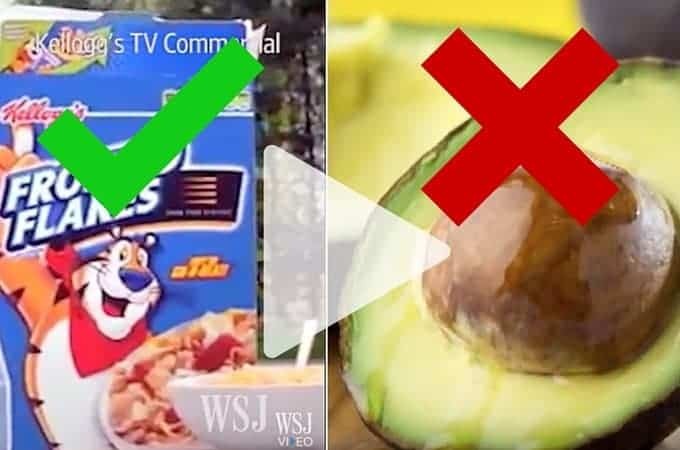 It’s Official – Frosted Flakes Are Healthier Than An Avocado!! The current definition of healthy is based on 5 criteria – fat, saturated fat, sodium, cholesterol and beneficial nutrients. So you can immediately see if the food industry formulates a food to match their criteria, you’re product will go flying off the shelf and officially you are ‘healthy’. When we are told that almonds, salmon and an avocado are unhealthy yet sugary processed cereal, flavoured high sugar low fat milk and margarine are OK to consume, you know it’s time to ignore the healthy eating guidelines forever and that %$#!! food pyramid. Do we wait until the guidelines are changed? Well I’m not and my family isn’t either. Take responsibility, take your own health into our your own hands and just eat real whole food. Not processed. Not fortified. Not made in a factory. And as for those star ratings or health ticks? Ignore them and you’ll be far better off. So what can the food industry do to improve public health? Watch the video that Dr Yoni Freedhoff MD made when he was invited to a food industry symposium on health and nutrition policy. Without even the courtesy of a phone call, he was disinvited. So using the power of the internet he has now reached more people than he ever would have if he was able to attend. What can the food industry do? So what can we do? Today we can start voting with our $$. Our buying power is the most powerful tool we have today. Stop buying soda, cereal, junk food and fake foods. Eat real whole food, food that our grandmother would recognise, real meat, fresh fish, fresh vegetables, full fat dairy, healthy fats that were available 100 years ago (not those that have been invented in our lifetime), drink water and cook at home. It’s really not that difficult to ignore the healthy eating guidelines and cook your own dinner, the fast food industry just makes it appear so when you compare it to opening a packet and dinner is ready. Wow, thanks so much for the info and links! I agree — so much needs to change in the guidelines and industries! And while our buying power is the front line of the battle, there’s another way we can fight: Join opinion survey sites and tell them what we want –and don’t want. These food companies survey consumers to test the market for new foods and trends. If enough of us let them know how we feel about their products, and why we aren’t buying them, we might be able to turn the tides more quickly. We the people have the power, stop buying junk! We have a young adult still living at home who eats LCHF with us most nights …. But I can’t get him to stop eating Weetbux and sugar for breakfast. Yes I know you say stop buying them, but he would stop eating breakfast. He won’t eat bacon and eggs, my homemade granola, quiche for breakfast etc. then he buys sugary energy drinks, pies, pizza, chocolate . I talk to him about how sugar feeds cancer, and could make him T2, but this message is not getting through. I don’t buy juice, biscuits, cakes any more, but struggle to get him to understand. Libby, I love your recipes, Facebook pages and the website. Thank you so much for getting the word out there. I loved the video/presentation you shared from Dr. Yoni Freedhoff. Everything he said is so true. My kids beg me all the time for store bought cereal and gummy snacks despite having low carb cereal and treat options at home – even when they KNOW I’m going to say “no”! When we visit my parents, out come the whole grain cereals, low fat muffins, pancakes, sugary low fat yogurts, cookies, chips, ice creams and fruit. Why? Partly because my mom wants to spoil her grand children and partly because she feels sorry for them because she knows I don’t buy that stuff at home – I make it myself without sugar. She thinks they are missing out! Although my mother is set in her ways (a staunch supporter of low fat eating) and watching an informative video like Dr. Freedhoff’s would be lost on her, I will certainly share this with my brother and his family. Thanks for finding all of the best articles/information and sharing them with us. Kim I hear this so often, relatives trying to ‘make up’ for what they think our children are deprived of. Even with us making sugar free and low carb treats there are so many occasions where they still eat sugar and other ‘treats’. They are not deprived in any way, shape or form. My mother also used to give my children sweets and biscuits. Because I couldn’t explain the full low carb to her (sadly she has Alzheimers) she understood that I want my children to have less sugar so she eventually relaxed and only bought 1 pack between them on visits and she also knew I would put half the biscuits and muesli bars she served away before my children saw them. Cutting back was an easy way I could make us both happy. Dr. Yoni Freedhoff is fabulous isn’t he? I have shared a couple of his videos now. His humour, wit and concise delivery make for a compelling watch and argument which is easy to understand. Oh, Libby. I made time to watch this. Yes to what hes’ saying. I’d love even simple billboards around town on photos of real, lovely food plates! Here in town, we have cancer billboards. And then, we have photos in local health magazines of cancer victim survivors baking chocolate chip cookies. It is killing my heart! Breaking it! Especially as I wrote a post recently on the adolescent brain. Then learned just after I wrote it of research showing how our gut bacteria (when need whole, real food) help make the myelin sheath which is needed to solidify the emotional center of the brain to the frontal region which plans, has foresight, supplies rational thought. So what we are eating is without a doubt destroying the intact functioning of our children’s brains. Good job, Libby. Keep working! Hi Terri, I completely agree. It also breaks my heart when I see cupcake breast cancer morning teas, chocolates to cure diabetes, and bake sales for children’s hospitals etc etc. The amazing volunteers are well meaning and genuinely trying their best but if only they were told the truth the sugars and processed foods are the biggest dietary contributing factor to many cancers, diet related diseases and as you so eloquently explained, brain development. When I see kids walking home from school sucking on an energy drink like it’s a dummy, with a bag of crisps or candy in the other hand, if only they could understand they have one chance at adolescence. One chance at development. Nutritional deficiencies impact in so many areas of their health and they just don’t know it. I often think if a child (or an adult for that matter) was unfortunate enough to develop a major health issue, parents would do everything in their power to change their diet to improve their health, so why wait? Nourish our children (which is different to feeding them) and teach them how vital their physical health, mental health, development, immunity, and well being is. Thank you so much! Your last words brightened my morning. Food matters. Interestingly, in mice, the myelin sheath changes were partially reversible once they changed the gut bacteria, leading me to believe changing one’s diet is always worth it. It’s never too late to get started. Isn’t that wonderful!? Well, our summer activities start this week and the community pool opened this weekend! So summer is here! And the garden is planted! Yay! The fact that myelin sheath is partially reversible is incredibly encouraging. I listened to a NZ researcher who specialises on Alzheimers, has also found that brain matter can still be developed and continues to grow, far beyond what we previously thought. Sadly it is too late for my mother who has dementia, but new research may just help our children (and us). I’m so sorry about your mother. But, yes, we and our children are benefiting! Thank goodness we have informed people to help us through this very confusing and money driven industry and government. Keep doing what you do here, it does truly help! My family of 5 has switched to LCHF in March, combined we have lost over 100 pounds!! And that’s not being strict with the carb intake, we still eat root vegetables and various fruits (we’ve limited fruits to 2/day). We enjoy dark chocolate ALL the time!! My husband has reversed his diabetes and overall we ALL feel healthier and more energetic. Occasionally we miss the “old food”, but overall I have been able to mimic most of what we used to eat. 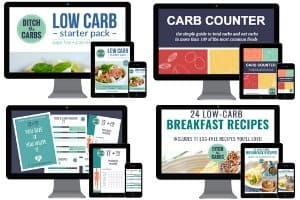 My husband and I have always felt the food administration was lying to us, and we teach our kids about advertising and what it’s targeted to do, especially to them. I’m glad to have watched this video, it backs up what we already felt we knew. Your wonderful results are the single reason I continue to work on my website. Helping families eat real food and gain health is my no.1 goal. It make some so happy. Congratulations to your entire family. I am sure the food industry are incredibly worried which is why they are putting so much pressure on lobbyists, advertising, marketing and funding research. I cannot fathom those who fight the “eat real food” message. There are ZERO side effects from eating whole food, yet look at the disastrous state of health the world is currently in from following guidelines and eating food that has been formulated to get ticks and stars. Ludicrous. The food industry does not care if it healthy or not, they only care about the profit!! It always amazes me that there are so many freakin idiots in high places that have influence and power. I’m so glad my kids are grown and I don’t have to deal with the food police in schools. Unfortunately my kids are having to deal with it with my grandkids. Thanks for this article though because too many “experts” are truly confusing people. The other thing to remember is that if money or politics are involved then there is ALWAYS a self serving agenda behind it. I feel your pain Lisa. I’m a new grandma who wants to adopt what I did not know when I was growing my kids. Unfortunately the poor child has another grandma who thinks margarine is healthier than butter. Soya is prefered and healthier that meat.Fat and lard should be be flushed down the drain. Horror of horrors I caught her adding sugar to warm water she fed to the new born. Apparently sugar fixes upset stomach. This grandma means well. This is what we were taught for more than 30 years. It took me a lot of reading and reseach to wrap myself around the new food revolution. I can just imagine my grandson ‘s lunch box with his juice , sandwich , mini chocolate etc . There is no dought in my mind that his first solid food will be cereal. How do I sit back and feel comfortable ?